QUESTION: Mr. Armstrong; I love the fact that you look at everything from a pure cyclical perspective. Al Gore who started this whole mess was not a climatologist. He was a politician. You are 100% correct that people will believe what they want to believe. There is no talking to one of this idiots. When there is a food shortage, they will be the first to advocate taking food from those who did prepare. Did wheat rise in value during the Dust Bowl because of the decline in supply? They don’t have wheat charts that go back that far on ____ system. ANSWER: You cannot forecast the future of anything in isolation. I only look at the cycles. The computer correlates absolutely everything including the weather. The correlation models show that we are heading into a colder period. This is when crops fail and the ground freezes as far down as two feet, which makes winter crops impossible. We are also heading into a solar minimum and that is when there are far more volcanic eruptions and earthquakes. All I can say is that it appears that when the ECM turns, the next wave will be back to an inflationary run and we should also see a rise in commodity prices. We have two major trends behind that: 1) weather, and 2) fiscal mismanagement resulting in currency value changes. 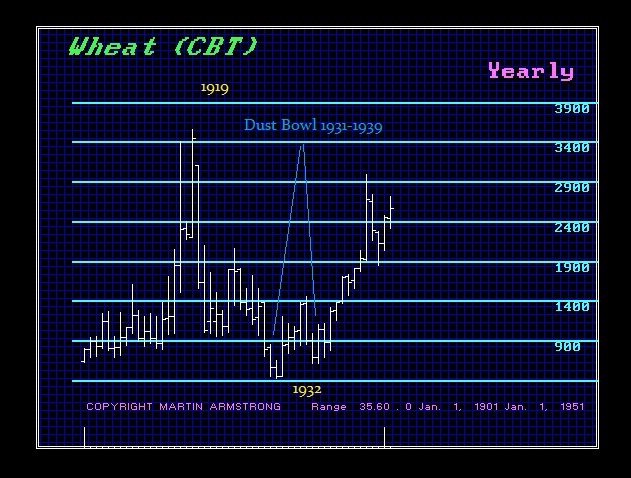 The Dust Bowl Rally in wheat was about 245% advance 420 to 1452. What also came into play, interestingly enough, was the devaluation of the dollar in 1934 from $20.67 for one ounce of gold to $35. That was effectively a near 70% devaluation of the dollar. We are approaching our Monetary Crisis Cycle, which will again mark the decline in purchasing power of world currencies. Just maybe we will see a very similar convergence of trends that took place during the Dust Bowl era. Farmers going Bankrupt – A Prelude to a Boom?